GH3D-382 | Size: 200 ml / 6.76 fl. oz. 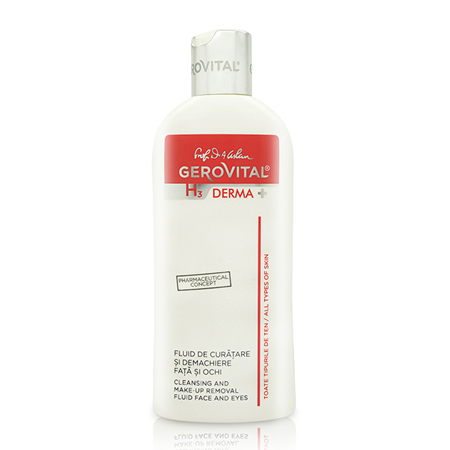 A fluid formula that effectively removes makeup while cleansing and toning the skin. Enhanced with gentle emollients and soothing ingredients is recommended inclusively for cleansing the sensitive skin. Olive Oil - gently removes impurities and restores the skin's hydrolipidic protective film. Apply the fluid on the face, neck and décolletage, in the morning and in the evening. Gently massage to emulsify impurities and remove with a cotton pad. INGREDIENTS: AQUA, CAPRYLIC CAPRIC TRIGLYCERIDE, OLEA EUROPAEA FRUIT OIL, GLYCERIN, CETEARYL ALCOHOL, CETEARETH-20, PHENOXYETHANOL, ETHYLHEXYLGLYCERIN, STEARIC ACID, PALMITIC ACID ZANTHOXYLUM BUNGEANUM FRUIT EXTRACT, OLEYL ALCOHOL, PARFUM, HYDROXYETHYL ACRYLATE/SODIUMACRYLOYLDIMETHYL TAURATE COPOLYMER, SORBITAN ISOSTEARATE, POLYSORBATE 60, TETRASODIUM EDTA, SODIUM HYDROXIDE, BHA.